NEW Premium Silk Folders – 20% Off! Have you ever wondered why we only offered our Folded & Glued Presentation Folders in Fabu-Gloss, Luxury and StarMarque finishes? Yeah, so have we. Well, wonder no more! 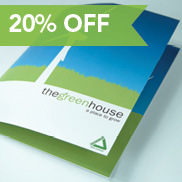 We now offer these popular folders in a more affordable Silk finish. They’re still made from the same durable 140# stock, but without the extra coatings we add to create our Fabu-Gloss, Luxury and StarMarque finishes. Now’s a perfect time to try these new folders, because they’re 20% off in July. Save up to $497!